T.L. Davis Preserve integrates the beauty of the Loess Hill Mixed Grass Prairie, Bur Oak Savanna, and Eastern Deciduous Forest. The objective of T.L. Davis Preserve is to maintain an ecologically sustainable wildlife preserve comprised of a gradient of ecosystems, extending from Loess Hill ridge top Mixed-Grass Prairie and Bur Oak Savanna to Eastern Deciduous Forest lower slopes, which together support environmental education and research in a remnant of Nebraska’s historic natural landscape. Overlooking the Elkhorn River and the Elkhorn River Valley, the T.L. Davis Preserve is situated in western Douglas County, Nebraska. The entrance to the preserve is located at the north end of Pine Ridge Road, generally south of Q Street and east of 245th Street (Legal Description: Section 9, Township 14 North, Range 10 East of the 6th P.M). GPS coordinates are: Latitude: N 41.19759 Longitude: W -96.29893. T.L. Davis Preserve is a 9 ha (22 acre) preserve that was donated to the University of Nebraska Foundation in 2005. 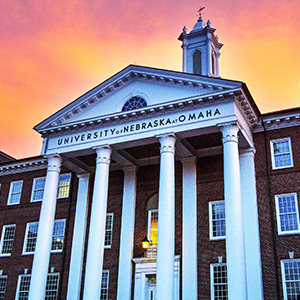 At the time of acquisition, the Foundation arranged for a 25-year lease to the Board of Regents of the University of Nebraska with the stated intent that the Department of Biology would manage the preserve for research and educational purposes and that the lease would be continued with subsequent 25-year leases. Named after the donor's grandfather, Thomas L. Davis, the preserve adds remnant Loess Hill Mixed-Grass Prairie, Bur Oak Savanna, and Eastern Deciduous Forest ecosystems to the Tallgrass Prairie of Glacier Creek Preserve, thereby increasing the diversity of ecosystems available through UNO for research, education, and general appreciation. T.L. Davis Preserve is generally divided into two units, the east-to-west oriented West Ridge and the south-to-north oriented North Ridge. 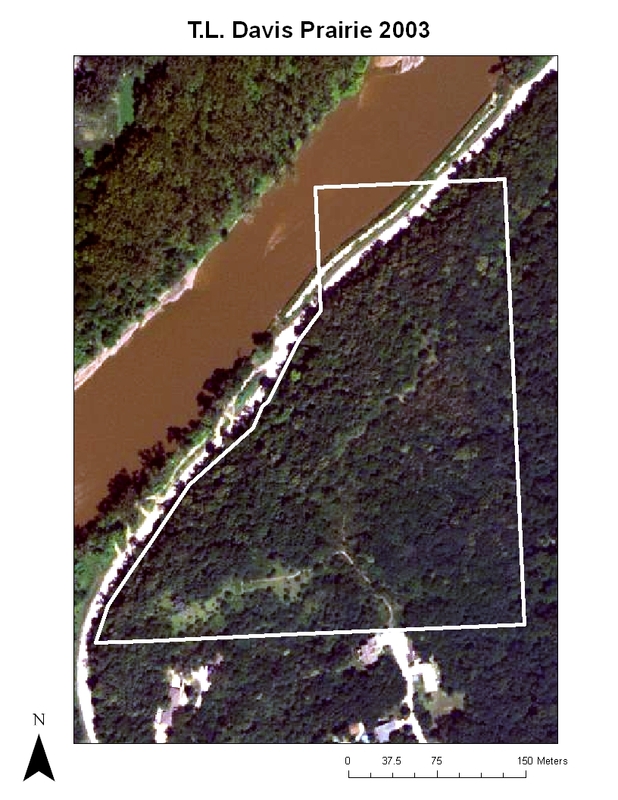 A small portion of the preserve extends into the Elkhorn River where the Elkhorn River Research Station is situated. This station is directed by Dr. Alan Kolok. The savanna and upper-slope woodlands of the preserve are dominated by bur oak (Quercus macrocarpa). Woodlands of the lower slope are dominated by bur oak and basswood (Tilia americana) with fewer numbers of species such as red elm (Ulmus rubra), green ash (Fraxinus pennsylvanica), and bitternut hickory (Carya cordiformis) (unpublished 2016 data; Ellis). Understory herbaceous species include Dutchman’s breeches (Dicentra cucullaria), red columbine (Aquilegia canadensis), American bellflower (Campanula americana), white vervain (Verbena urticifolia), slender wild rye (Elymus villosus), and white snakeroot (Ageratina altissima). Fauna: No extensive faunal surveys have been conducted but, of the few verified observation made to date, white-tailed deer (Odocoileus virginianus) are common with other species observed including the white-footed mouse (Peromyscus leucopus), western harvest mouse (Reithrodontomys megalotis), Ring-necked Snake (Diadophis punctatus), and wild turkey (Meleagris gallopavo). A more complete survey of fish along the Elkhorn River reported finding 30 species of fish, including longnose gar (Lepidosseus osseus) and three species of shiner (Notropis sp.). No invertebrate surveys have been conducted, although the burying beetle (Nicrophorus sp.) has been observed at the preserve. Species Lists: Except for fishes, which is considered relatively complete, species lists are still being developed. Below are links to lists that include species for which identification has been verified by individuals considered experts in their field. Soils: Surface soils of T.L. Davis Preserve are Mollisols dominated by Ida-Pohocco-Monona silt loams on 11 to 30% slopes (ca. 75% of preserve). Hilltop soils are Marshall-Contrary silty clay loams on 3-7% slope (ca. 25% of preserve). Small areas of soil adjacent to the Elkhorn River consist of Platte, Inglewood, and Barney soils that are subject to occasional flooding. Topographic Features: The elevation of the preserve ranges from 347 to 384 meters (1,140 – 1,260 feet) above sea level. Relief of the preserve from the central ridge is approximately 37 meters (120 feet). Depth to ground water is 9 – 24 meters (30 – 80 feet) below ridge-top ground level. Natural History: Historical records from 1880 describe the loess bluffs of the Elkhorn River in the region of the preserve either as open grassland savanna with scattered bur oak or as tallgrass prairie with trees or groves along the river valleys (Hewes 1981). This description is consistent with both 1941 aerial photos of the preserve’s location and the presumed fire regime of the area where fires occurred with sufficient frequency to prevent woody plant encroachment of grasslands. The Eastern Deciduous Forest that presently dominates the mid- and lower slopes of the preserve includes widely dispersed, large bur oaks with low spreading limbs suggestive of trees once growing in an open-canopy environment with grass understory, such as would have characterized a savanna. Today, though, these old oaks are embedded within a fully canopied woodland and surrounded by smaller sized trees. This increase in tree canopy is consistent with the area shifting from a savanna to a forested ecosystem, a shift shown in aerial photos where tree cover increased 210% between 1941 and 2003. During the same time, the area covered by grass decreased 92%. 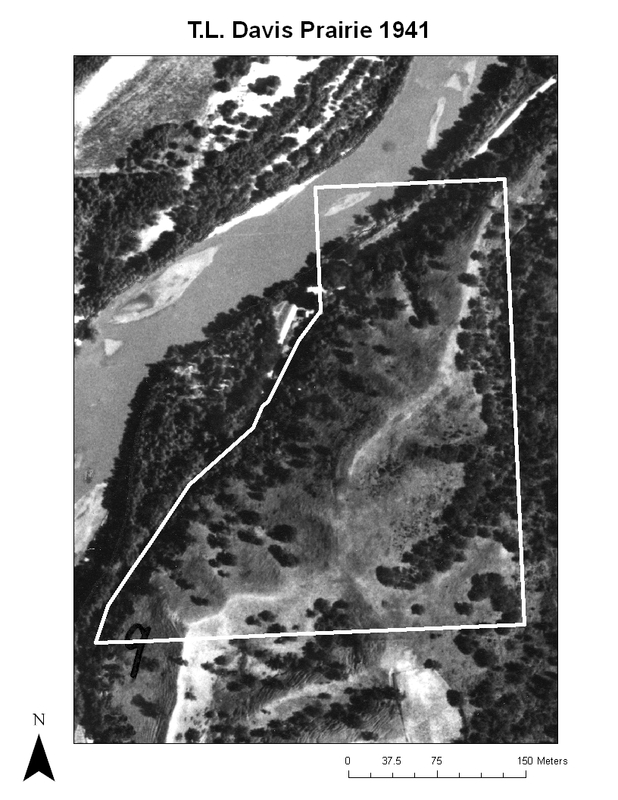 Anthropogenic History: Cultural resource assessments along the hills north and east of the preserve identified archeological sites indicating Central Plains Tradition, Native American occupation of the area ca. A.D. 1000-1400 (Bozell 2005 and 2005). Although no such sites have been identified specifically on T.L. Davis Preserve, future research is highly likely to find some evidence of its occupation by native peoples. More recent anthropogenic use of the site is indicated by remnants of an old fence near the ridge-tops suggesting the site was grazed by domestic livestock. Tree-ring data support the grazing hypothesis suggesting that domestic livestock grazing most likely continued until 1970-1980 when bur oak tree recruitment increased rapidly (Guetersloh 2008), presumably in response to the removal of livestock. There was no evidence of grazing at the time the property was acquired. In addition, the absence of tree stumps suggests that logging did not occur to any extent on the site. Guetersloh, E.R. 2008. Historic savanna and extant east-central Nebraska loess bluff bur-oak communities. Master’s Thesis. 19 p.
Hewes, L. 1981. Early fencing on the western margin of the prairie. Annals of the Association of American Geographers, 71: 499-526. 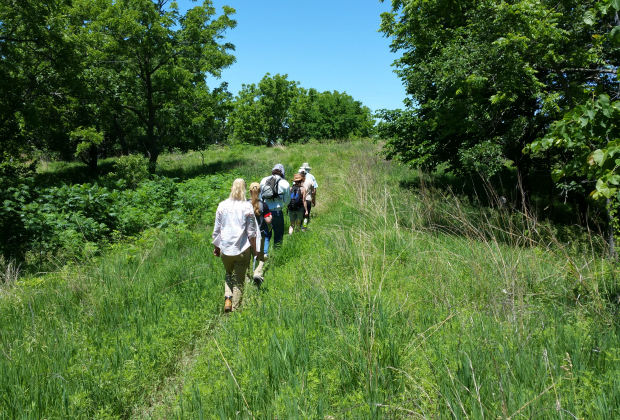 Preserve management, the responsibility of UNO’s Department of Biology, has been developed to establish and maintain a gradient of wildlife habitats to support education, research, and general visits to appreciate native, historic habitats. From prairie and savanna ridgetops and upper slopes to lower slope woodlands, the habitat gradient being developed reflects our approximation of historic conditions using, as our points of reference, both data collected from research and 1941 aerial photos of the site. These sources provide a long-term goal of reestablishing a mix of grassland and savanna over approximately 55% of the preserve with the remaining 45% in woodland. Figure 1. Aerial photos from 1941 and 2003. In the 1941 photo, light colored areas represent prairie, mostly situated on upper slopes and ridgetops. Scattered dark areas are either individual trees, representing the area of savanna, with continuous dark areas indicating the location of forested areas. Preserve management involves efforts in both (1) restoration and (2) long-term management. Restoration of savanna and prairie was initiated during the summer of 2005 and continues today. The principal focus of these efforts has been removal of all trees and non-prairie shrubs, other than bur oaks, from the upper-most slopes and ridgetops. The removal of eastern red cedar (Juniperus virginiana), roughleaf dogwood (Cornus drummondii), and smooth sumac (Rhus glabra) have been of particular concern. 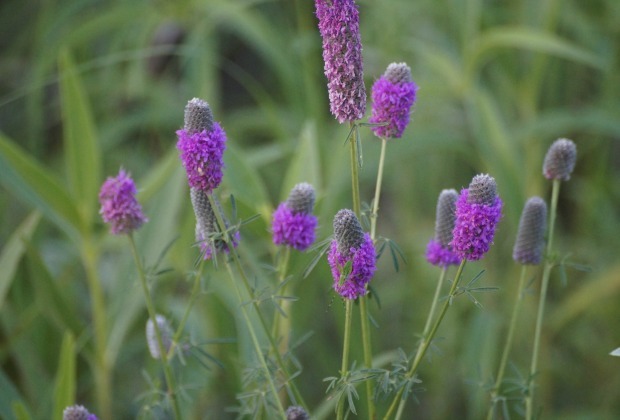 Woody plant removal, which involves a combination of cutting and herbicide application, is important to prairie restoration because it removes canopy vegetation allowing sunlight to reach remaining prairie plants. Sunlight is required by prairie plants both to ensure their survival and to provide suitable conditions for prairie seeds to germinate and grow. As prairie vegetation reestablishes itself, future efforts will be to expand the prairie further downslope until reaching mid-slope locations where prairie-savanna will grade into woodland. Long-term management of savanna and prairie is designed to maintain conditions that favor herbaceous species (i.e. grasses and forbs) while preventing extensive woody plants from becoming established. These conditions are maintained at T.L. Davis Preserve by conducting prescribed spring burns of either the West Ridge or the North Ridge every 2-3 years, a fire frequency intended to approximate historic conditions. To maximize site heterogeneity and protect resident biota, only one ridge is burned in any year. Whether this management regime will maintain a dynamic population of widely scattered bur oak is yet to be determined as conditions for savanna oak regeneration are poorly understood among various savanna ecosystems. Monitoring of the plant community at the Preserve will provide some insight on the success of our current management. An accidental fire of unknown cause along the West Ridge in early 2005 was the first recorded fire on the preserve. 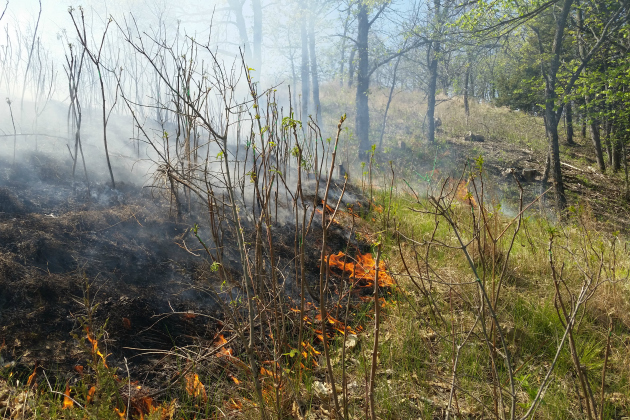 The first prescribed burn at the preserve was conducted in spring of 2013 on the North Ridge. The West Ridge was first burned in the spring of 2014. 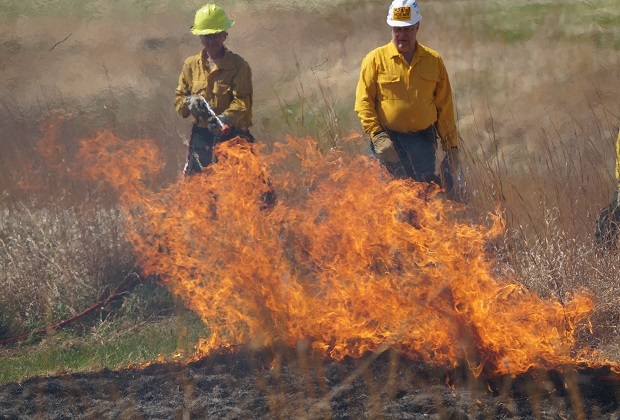 To learn how to get involved with prescribed burning or land management, visit the Volunteer page. Motorized vehicles are not allowed outside of the parking area, which protects the preserve’s flora. See below for details regarding parking. Hunting is not permitted in order to protect the preserve’s wildlife. Pets (on or off leash) are not permitted in order to protect the preserve’s wildlife. Collection of plants, animal, or other natural material is not permitted without written approval of the Preserves Director in order to protect our flora and fauna. Do not disturb colored taping or flagging since they identify research projects. Take your trash with you so the preserve can be appreciated by the next visitors. Parking: Parking space is limited at the preserve so car pooling is recommended. The small parking lot located just inside the entrance to the preserve can accommodate approximately five cars. The entrance to the lot is not wide enough to accommodate large vehicles, such as busses. When not parking in the designated preserve parking area, please do not block our neighbor's driveways, something about which they are particularly sensitive. Non-Research Use (classes, organizational visits, etc. ): Use of T.L. Davis Preserve is encouraged for classes, organizations, and others just visiting to appreciate the preserve’s natural environment. For classes or groups planning to visit the preserve, we recommend contacting the Preserves Director in order to avoid conflicting group-use of this relatively small site. Research Use: We encourage use of the preserve for both long and short-term study. 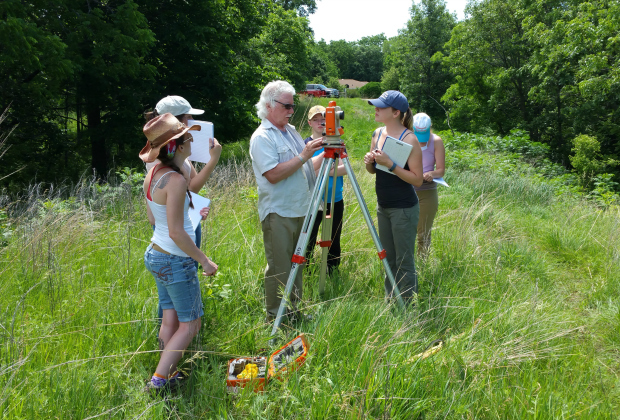 In order to coordinate use of the small preserve, all research projects must be submitted to the Preserves Director. T.L. Davis Preserve provides a site for research on loess hill or savanna ecosystems of eastern Nebraska. Below is a list of completed or ongoing studies at the preserve. Ellis, M. 2014. Distribution of canopy trees by aspect at T.L. Davis Preserve. Independent Research Project, University of Nebraska at Omaha. Erickson, S.A. 2011. 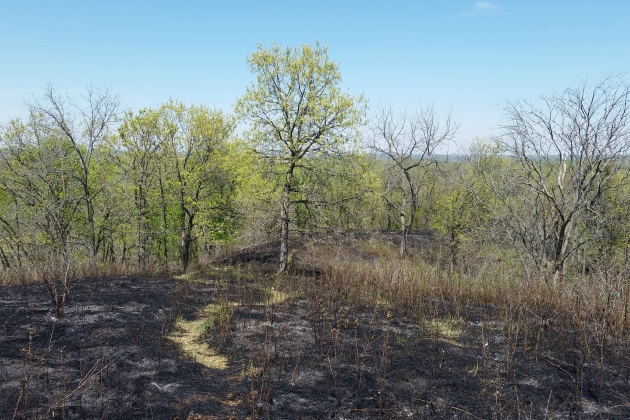 Plant species, composition, diversity, and dynamics in a Loess Hills Oak Savanna restoration. Final Research Project for Master of Arts. Guetersloh, E.R. 2008. Historic savanna and extant east-central Nebraska loess bluff bur-oak communities. Masters Thesis. 19 p.
Bragg, T.B. and B.A. Hayes. 2011 to Present. Long-term recovery of Loess Hills prairie following removal of Juniperus virginiana encroachment. Ellis, M. 2016 to Present. Distribution of veteran savanna oaks in a remnant Loess Hills preserve. Master’s Thesis Research, University of Nebraska at Omaha.